It’s rare for the same medication to be used for both medicinal and cosmetic purposes. But bimatoprost (also sold under the name brand Latisse®) pulls double duty. In addition to treating glaucoma, it can be used to grow and thicken eyelashes. It’s effective for both purposes, but is it safe? Can it cause lasting changes to your eyes? The answer to both questions, according to ophthalmologist Julian Perry, MD, is yes. On its own, bimatoprost is a prostaglandin – a fatty acid that has hormone-like effects on the body. As an eye drop medication, it’s used to treat glaucoma by relieving the pressure inside the eye. It can cause lasting brown discoloration of the iris over months or years of use, as well as periorbital fat atrophy – a hollowing-out appearance of the eyelids. In an eyelash grower, bimatoprost’s function and effects are slightly different. Before application, wash your hands and face, removing any makeup. The solution is used once nightly and is placed at the roots of the upper eyelashes with a single-use applicator. It works by creating more hair follicles during the hair-growing cycle. Remember, Dr. Perry says, Latisse is approved by the Food and Drug Administration (FDA) for use on the upper eyelashes only. It may spread to the lower lashes as you blink but the primary effect will be on the upper eyelashes only. Don’t worry if any medication gets into your eye – it’s used to treat glaucoma and is unlikely to cause damage. Results usually appear within two months. 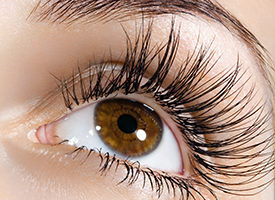 If you stop using eyelash grower, your eyelashes will gradually return to their original state. The FDA approved Latisse for eyelash growth in 2008, and it’s deemed safe for for adults. Because bimatoprost is the main ingredient, if you have glaucoma and are already treating it with medication, consult your ophthalmologist before using Latisse, Dr. Perry says. In particular, mention if you’re already using latanoprost or travoprost. Using these drugs in combination with Latisse can increase treatment side effects. While bimatoprost’s side effects are permanent, when used in eyelash grower, they can fade when you stop using the product, Dr. Perry says. Patients can experience eyelid itching, dry eye, eyelid darkening and bloodshot eyes. Eye and eyelid swelling, as well as some allergic reactions, are possible, according to the FDA. More significant reactions include increased eyelash growth in the corners of the eyes and excessive eyebrow growth if the medication touches them. Report any eye pain, infection or vision changes to your ophthalmologist immediately, Dr. Perry says. If you wear contacts and want to use Latisse, you should know that the FDA warns that your contacts can absorb the product, which can discolor your contacts. Remove your contacts before you apply the solution, and wait 15 minutes before putting them back in.